Early riser or simply confused? What a winter we have had over in the southern half of the UK this year, there has barely had any frosts, which is quite bizarre. Thinking back over the years, I don’t remember any winters being quite as mild as this one and by the looks of it neither does this daffodil…this one is an early riser! 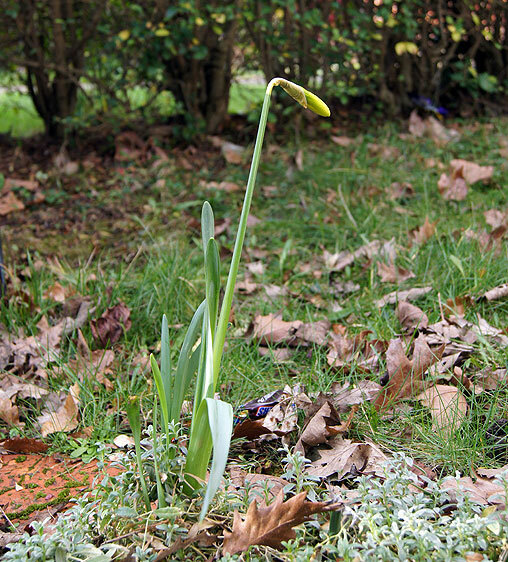 This poor confused daffodil in my front garden was raising its head up above the soil at Christmas time, yes at Christmas!! Maybe it was hoping to catch a glimpse of Santa and not miss out on the action (lol). It has been growing extremely slowly and taking its time after its sudden growth spurt ahead of schedule. Traditionally daffodils appear in February to March time, but not this one oh no! All of the others are all emerging out of the soil slowly, but I think this particular Daff wants to win a couple of medals for bravery and best time, with the flower almost open. One harsh frost is all we need to snub its Olympic chances…. This entry was posted in General and tagged december, garden, flowers, daffodils on January 25, 2012 by Sherrie. This has been an extremely mild winter, so many of the plants and tree's seem very confused. Many have started budding early and been caught out with the frosts.